Here we have yet another truly awesome and bizarre animal friendship story. This is the story of a Tiger, whose best friend, Just Happens to be one of the most gentlest and loving dog breeds, the Labrador Retriever. On a Nature preserve, on South Carolina's Myrtle Beach, Paramesh and Krishna, a pair of Tigers, spend their days, playing with their best buddy,Buda, a Labrador Retriever. 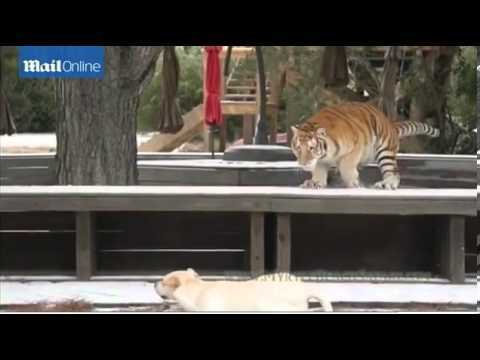 Check out these totally amazing pictures of these beautiful animals, playing together in the snow,. Apparently it only snows about 'once a decade' according to Doc Antle, who cares for the tigers. Come On Buddy Chase Me! Lets Have A Little Rest And Relaxation! Could This Be The One Of The Most Extraordinary Cross Species Parenting Stories?